A practice founded in 1939, Rhatigan Architects’ growth and reputation for delivery has resulted in an award winning service underpinned by professional excellence. The Sligo based practice, with offices in Donegal and Dublin, work across a range of residential, commercial, healthcare, education and mixed use projects with a reputation for bringing both a personal touch and a wealth of experience to each and every project. Award-winning and specialising in high quality deliverable design, Rhatigan Architects offer a complete architectural service from inception, concept design, statutory approvals, contractor procurement, to management on-site — all the way to post completion. Their services include expertise in Architecture, Master Planning, Interior Design, Conservation, Building Information Modelling (BIM) and Sustainable Design. Their hands-on approach includes managing key stakeholders throughout the project, offering clear direction and driving the project forward through every stage to realise the clients’ vision. Rhatigan Architects combine high quality deliverable design with commercial acumen and are widely considered to be one of the most exciting architectural practices in business at present. “Our team are experienced and are well versed in feasibility, design, construction and management of all project sectors. We all share one common goal: to realise our architectural vision and our clients’ design brief on time and on budget. Rhatigan Architects are always striving to create elegant designs with conceptual clarity, their design process is informed by both traditional craft based techniques and the possibilities offered by modern materials and fabrication methods. 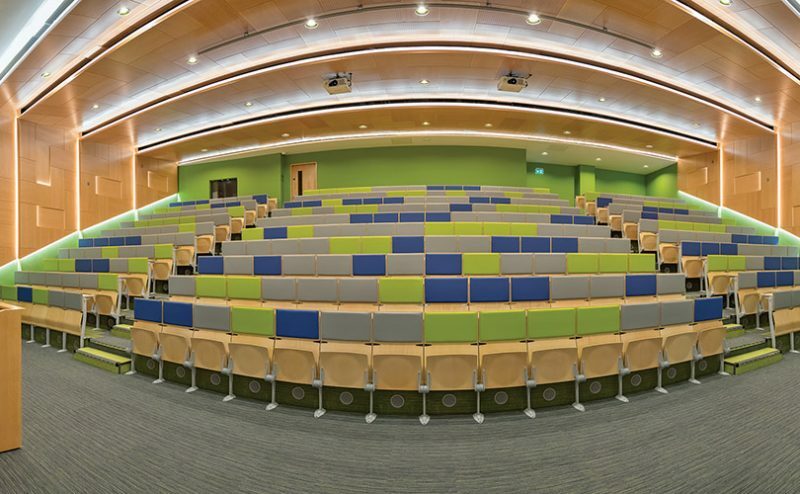 One of their most recent projects saw them shortlisted for a prestigious award as they were nominated in the category of Education Project of the year for their beautiful upgrade of Blocks C&D and the Aurivo Auditorium within I.T. Sligo at the Irish Construction Industry Awards Ceremony held earlier this year. The upgrade of Blocks C&D and the Former Foundation Lab were commissioned by I.T. Sligo to facilitate their ever-expanding campus. Built in the 1970’s, the former RTC building had last been upgraded in the 90’s, whilst the area that the Aurivo Auditorium now occupies was a disused double height space in the heart of the campus. In designing the project, Rhatigan Architects have created a new external identity to the campus and a striking new entrance. The building has been designed and constructed in an energy efficient manner that reduces its environmental impact while maintaining an internal space that is comfortable and enjoyable for students, staff and visitors. The internal works to Blocks C&D involved the introduction of two large roof lights which bring natural daylight deep into the building. As well as the creation of a series of social learning spaces along the corridors that succeeded in enlivening the atmosphere within the school for both staff and students. Gavin added that the company was very busy at the moment with a number of projects ongoing across the country. “We are currently working on a number of social housing schemes in the Dublin region. We have been involved in social housing for a number of years now, with one of our first projects in this area the award winning St Michael’s Road development in Longford town. Rhatigan Architects have always placed a great emphasis on quality and to continue that trend, they are not afraid to invest in the business. In the last few years, their design team has transferred from using CAD to BIM, which Gavin revealed has helped improve their service. Next year will see Rhatigan Architects celebrate their 80th anniversary. A remarkable achievement for a business that relies on the construction industry which has been through so many turbulent times over the course of those decades, but are still here and stronger than ever.